Schoolhouse Arts Center is bringing the whimsical world of Dr. Seuss to life on stage in their production of “Seussical the Musical,” and they’re doing it with a unique twist. Throughout the production, American Sign Language (ASL) is incorporated into the usual singing and dancing. When director Zac Stearn, who is also the Artistic Director for Schoolhouse Arts, announced that ASL would be infused throughout the show, I wondered if it would be a distraction, detracting from the momentum of the show. Instead, I almost forgot it was happening, as it was beautifully intertwined into each scene, often feeling like an extension of the choreography. The show, with a cast of more than 30 characters – many of whom felt like old friends, was lively and engaging, capturing the full interest of the audience; even the numerous children in attendance. It’s a perfect show to take children to see. The continuous flow from song to song keeps the action moving forward, and there are often so many different things happening on stage that it’s almost impossible to not be engaged. One of the things I enjoy most about shows at Schoolhouse Arts Center is how well they use the space they have, and this show was no exception. The set allowed for the cast to move freely on stage, and cast members used the sides and the center aisle as well, drawing the audience into the magical world of Seuss. With a cast that large, movement could have felt crowded and overwhelming, but it never did. This show is all about the music. Every scene is a song that moves the plot forward. Narrated by the Cat in the Hat, the main story follows Horton the Elephant in his quest to save the miniscule Who planet. There are several other stories incorporated into the songs, which are centered on the beloved books of Dr. Seuss. The cast began with high energy and maintained it throughout the show. There were times when it was difficult to hear soloists, but overall the cast had good projection and was able to pull me into the action. The choreography was fun, engaging, and well executed. This musical, like the books of Dr. Seuss, manages to subtly incorporate several important messages into the show: respect for the lives of others; appreciating what you have; and the importance of embracing your own unique qualities are just a few examples. This is a feel-good show well worth the time and ticket price. 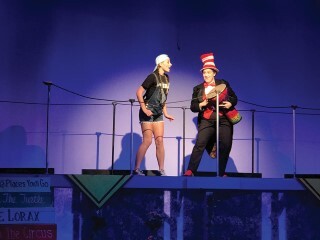 “Seussical the Musical” is playing through July 29th on Thursday, Friday and Saturday nights at 7 p.m., and Sunday evening at 5 p.m. Tickets are $19 for adults, $17 for students and seniors. Tickets can be purchased at www.schoolhousearts.org or at the door.